This chapter describes the Kung Fu techniques from the previous chapter and rituals. It also describes a new system of Kung Fu in the game; Unorthodox Kung Fu. Note: The Urn Minion is inspired by a creature from the film Miracle Fighters (1982). These are techniques of an exceptionally unorthodox and reckless nature, practiced widely by worshippers of Gushan. The results of Unorthodox Kung Fu are unpredictable and produce harmful effects for the caster when they fail. These effects are usually described in each entry. 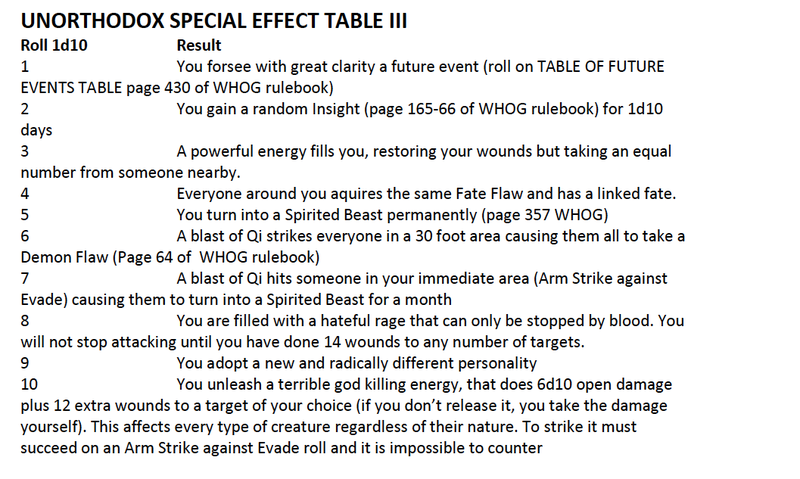 If you ever fail by rolling all 1s, 2s and 3s, roll on the SPECIAL EFFECT TABLE as well. Many of the rituals related to Gushan rely upon the collective power of humanity. One person casting the winds of Gushan is nothing, an army of people summoning the winds can destroy a city. All ritual magic related to Gushan tends to operate on this principle. Sinja Magic is commonly practiced in the south. In the north it is generally regarded as black magic. This is magic that affects people by bestowing blessings, curses or achieving some particular effect on them. However ,it requires a part of the person to cast. With this Ritual you place an infant inside a clay vessel, such as an urn or a wine container. You must feed the child a rice porridge made from human ash over the course of many years. This ritual must be performed once per year until the child becomes an adult. With each successful result, the child grows into the receptacle like a turtle in its shell, and the porridge changes its personality. They are relatively harmless until full grown, but if they reach adulthood through this process they become an Urn Minion (See URN MINION below). This requires that you acquire a person’s blood and fingernails. Then you must prepare these with a kind of rice porridge while visualizing a dark energy pour into the mixture. On a Successful Ritual roll, anyone who eats it falls in love with the next person they see for 1 month. This requires the hair of the target (s). Once you have the hair you must weave it into a rope-like whip and blow gently upon it to harness the power of Gushan. Make a Ritual Roll TN 8. On a Success, for the next ten rounds, regardless of distance from the target (s), you can whip at them with the braided hair as if you were standing before them. This requires a Light Melee roll against their Parry, and does 2d10+Speed for Damage. The target cannot use a normal counter but can resist damage by making a Meditation Roll against your attack roll. This requires you obtain the hair of the person or people you wish to protect. You must gather up all the hair, spill some of your own blood upon it, then burn it in a massive fire making a Ritual Roll TN 6. On a Success, for the next day, the target is immune to the entanglement of demonic spiders, moths and similar, web-spewing creatures. You draw in a powerful intake of air that rips apart the flesh of demons. Make an Endurance roll against the Evade of all creatures in the area (50 feet per rank of Neigong). 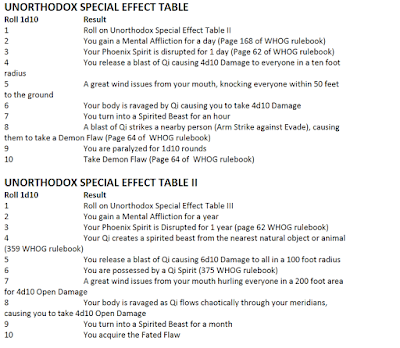 Any Demons or Spirited Beasts take 2d10 Damage plus 3 Extra wounds. Anyone with 5 or more Karma feels a sense of peace wash over them. Cathartic: This does 4d10 Damage plus 10 Extra Wounds to any demonic creature and restores 1 wound to anyone with 5 or more Karma. You issue a powerful tornado of force from your mouth, that crushes bones, bursts eyeballs, or ruptures a person’s ears. Make an Endurance Roll against Hardiness of any one person within 60 feet. On a Failure roll below to see what happens to you. On a success the winds crush or destroy a limb or sense of your choice, doing 2 automatic wounds. On a Total Success the target takes 4 automatic wounds instead of 2. This must be used Cathartically and cannot be used on someone higher Qi rank than you. You awaken the divine spark within yourself, realizing you are Gushan and forming powerful ox tail blades along your forearms and hand ridges. Make a Meditation Roll TN 6. 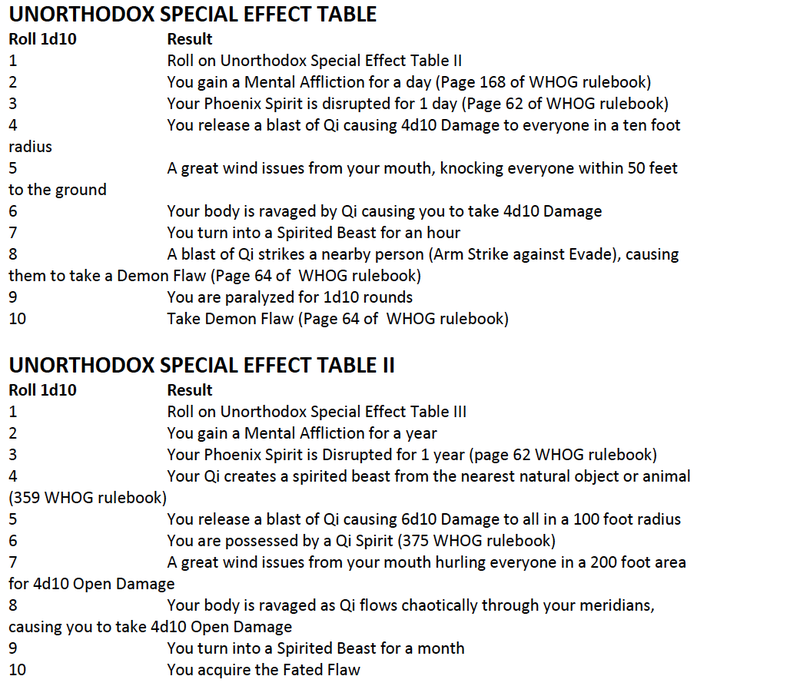 On a Failure, painful Ox Tail Blades erupt all over your body causing you to take 3d10 Damage plus 8 Extra Wounds. 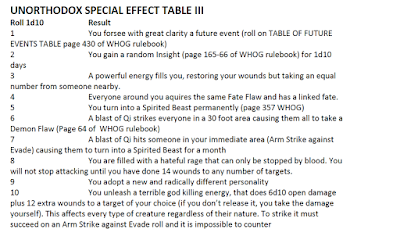 On a Success, you can strike an opponent immediately with the Ox Tail Blades for 2d10+Muscle plus 9 Extra Wounds. On a Total Success you can strike one additional target. This technique must always be used Cathartically. When the technique is finished, the sense of revelation passes. You recklessly smash your hands against your own meridians in a chaotic flurry of strikes, releasing your Qi energy with wild abandon. Make an Arm Strike Roll TN 10. On a Failure, take an Automatic Wound immediately and roll randomly on the chart below. This same effect happens to everyone in within a radius equal to Dianxue Ranks + Qi Ranks multiplied by 5 feet (this includes you and all allies). On a Success, you may choose the result of this roll for one individual. Everyone else suffers the randomly rolled effects as usual. On a Total Success, you may choose the result of this roll for 1 target per rank of Dianxue. Regardless of the success or failure of the technique, you take 1 Automatic Wound immediately due to the unavoidable damage this technique inflicts on your body and are drained for 1 day of 1 Qi (2 if you had to roll on the Special Effects table). This technique may only be used cathartically. It's chaotic, unpredictable energies cannot be countered by any known technique. You slice your blade through the air, creating a rippling line of energy that divides your enemies into warring halves. Make a Medium Melee attack against the Evade of any target in 20 feet per rank of Neigong. On a Failure the line turns upon you. On a Success the target is hit and splits into two halves (see below). On a Total Success the person is divided into three. Anyone affected by this attack is divided into two distinct replicas or aspects. They are not harmed, they merely form into two separate entities who desire to kill each other and cannot be rejoined until one half is dead. In this state the person’s wounds are divided between the two halves but they retain all other abilities. Any wounds taken while in this state, remain after the halves have been rejoined. If the person is divided into three forms due to Total Success, wounds are divided three ways and the third personality remains neutral, trying to resolve the conflict. This technique must be used Cathartically and all counter attempts against it must succeed twice. You send a wave of energy with the swing of your hard whip that cracks the bones of those who stand before you. Make a Heavy Melee against the Evade of all in a 60-foot cone before you. On a Success the targets lose 1 point of Hardiness for 10 days. On a Total Success they lose 1 point of Hardiness and are stunned for 2 rounds. This only works on targets with lower Qi ranks than you. These terrible creatures live in the south, usually in swamps but also in rivers or lakes. They look like monkeys with dense, swamp drenched fur, and a hard shell on their backs. Their claws are sharp and can infect people with Blood Fire. They like to pull prey below the water, drown them and drink their blood. Water Monkeys have a debilitating odor that is often the first sign of their presence. Stench: Everyone within 30 feet of a Water Monkey must make an Endurance TN 7 roll or vomit and take -1d10 to all skill rolls for as long as they are in its presence and for 2 rounds thereafter. Drowning Clutch: On a Total Success with their bite or claw, the Water Monkey can drag a person beneath the water. Escape requires two consecutive successful opposed muscle rolls. Killing the Water Monkey will also release the victim. This initiatives the Drowning Rules (page 83 of the WHOG rulebook). Blood Fire: Anyone struck by the claw of a Water Monkey is exposed to Blood Fire Disease (see page 100 of the WHOG rulebook). An Urn Minion is a foul-skinned creature, once human, that resides inside an urn or large wine vessel. Its hands and feel poke out from holes and its head emerged from the lid of the container. They serve their master dutifully, believing all of their master’s enemies to be completely evil. However if they form a strong emotional bond with another human or creature, the enchantment can be broken and they become mentally free. Urn Minions are incredibly agile and excellent at Kung Fu. They are made with the Baby in a Bottle Ritual. Marvelous Kung Fu: Urn Minions have great hand and leg strikes. Their arm strikes do 2d10 plus 2 Extra Wounds. Their leg strikes do 3d10 Open Damage. They can also Counter. Counter: Urn Minions can block melee attacks with their hands and feet. Roll Arm Strike or Leg Strike against the attack Roll. On a Success they block the strike. On a Total Success they can hit back as a free action. Breaking the Enchantment: This is not easy, it isn’t simply a matter of making a Persuade roll. One must befriend the Urn Minion and prove true friendship. Through this process, their loyalty to their master sways and they begin to lament their own nature. Hide: Urn Minions can retreat into their container by pulling in their limbs and head. This raises their Stealth to 10.